Posted November 28, 2013 by backupwp & filed under Guest Post. Christmas is almost upon us and all over the world we’re busy tracking down gifts to delight the crime novel obsessed people we love. There’s an unbelievably huge choice. You could buy any number of fabulous masterpieces from a community of very fine crime writers. But how about treating someone special to a crime novel series, a set of books that makes up a truly splendid, absorbing whole that’ll keep them off the streets and out of trouble for weeks. The thing is, it’s sometimes a challenge to find a list of an author’s books in order. And there’s nothing worse than missing one out, leaving a gap in someone’s enjoyment. If you want to buy a set of Lee Child books, for example, how do you know you’ve got the lot? And what about the remarkable John Grisham? 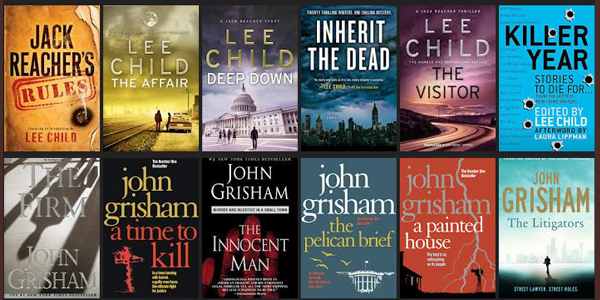 If you want to buy John Grisham books in order, where do you start? I thought it’d be a good idea to look at Lee Child Books in order and John Grisham books in order, providing a reference list of each for stressed, hassled book buyers. And I’ve topped off this post with a list of Joel’s three series in order: Lou Mason, Jack David and the marvellously feisty Alex Stone, the female lawyer currently causing a stir in the legal drama world – perfect if you want to introduce your favourite book lover to a new character with a bright future ahead of her and, we hope, more books in the pipeline. Lee Child, AKA Jim Grant, is a writer whose roots are in Britain but has adopted the US as his home, selling millions of highly-regarded crime books in both nations. 1997 – Killing Floor – The winner of an Anthony Award, Barry Award and Japan Adventure Fiction Association Prize, and a Dilys and Macavity Award winner. If you like thriller writers like Lee Child you’re bound to enjoy Joel’s three series. If you like John Grisham you’ll love Joel’s suspense-rich thriller books. And if you can’t stretch to the entire works of Child or Grisham, which gets expensive, you’ll be able to afford the full set! This series comes highly recommended by Michael Connelly. Trial attorney Lou Mason is laconic, witty, cack-handed with women, loves his dog and just can’t stay out of trouble. He keeps on sliding into the dark side, putting his own life at risk and endangering his friends and family. The result is a cracking suite of books that, while they stand alone perfectly well, are best read in the right order. Jack Davis is a respected FBI Agent who’s dedicated to crime-busting. But he also suffers a rare movement disorder that makes him shake, which causes problems when he needs to shoot. His family life is chaotic and tragic, providing an exceptionally rich back-story for a collection of crime novel adventures you just can’t put down. Like all great series, they’re best read in the right order. Joel’s latest legal thriller series features the characterful Public Defender Alex Stone, a driven but brilliant character who is locked in a constant battle with the moral dilemmas inherent in defending really nasty people, who are invariably guilty as sin but don’t always get the justice they deserve. Imagine you’re on the high dive, scared to death, and you jump off, blindfolded. Halfway down, you can’t tell if the pool is full of water or not. That feeling of absolute vulnerability and uncertainty is what graces Lou Mason. It is that rush, that excitement of knowing that the main character DOESN’T KNOW enough to protect himself and just enough to know he is in danger. As the story unfolds, Lou strikes out, makes mistakes, is lied to and mislead. His very relationships with others is either setting him up or helping him out. Even after you know what’s going on, Lou is not certain if the journey was to his benefit or not. It is this multidimensionality that makes Lou feel a part of you as you read. He, like you, is not sure what is going to happen next. He, like you, wants to survive. He, like you, is not sure that he can surmount the challenges. Goldman writes in the between of what has happened, and what will happen. Whereas other crime novels have the main character be an amazing superhero, with all the needed tools, Lou is not only human, he’s beyond human, with all the frailty and nobility that entails. Do yourself a favor and read this book, and every book by Goldman (His Jack Davis series is even more compelling). Even though I read these a little out of order, as soon as I read my first Goldman book, I bought the rest and enjoyed all of them. This was my first experience with Joel Goldman’s thrillers. I very much enjoyed the book. Kansas City is a refreshing change of location from the frequently used LA or New York City. The characters were well developed, the plot moved quickly and the requisite number of obstacles appeared at all the correct times. The ending satisfied without being sappy. I’m surprised we haven’t heard more about this talented writer. Alex Stone is good at her job. Maybe a little too good. She believes in the legal system so much that she does everything she can to give her client the best defense. She wins the case but loses so much more as things start to go downhill. The book has a riveting plot with some twists that I wasn’t expecting. The characters are well written. Their personalities come across the pages with intensity. I also got to see an old friend, Lou Mason. That was the treat for me. If you feel particularly generous you can buy all three sets. I love the way the characters from the different series turn up in each other’s stories. It makes the whole Kansas crime and law scene seem even more real. Like the last reviewer said, it’s a proper treat!